My life, at times, could give the best soap operas on television a run for their money. I’m not even kidding about that. I have a penchant for drama. But I don’t see this as a bad thing. On the contrary, I use it as fuel for my books. And as my good friend, author Megan Hart says, “All of this is fiction, and all of it is true.” She’s right. In Unworthy Heart—book 1 of The Donnellys series—the heroine, Maiya, is a tattooed, independent woman who works in the corporate world. Been there—actually, I’m still there. I know what it’s like to walk that fine line between who you are underneath your business suit and the persona you must display in front of others. In Defensive Heart—book 2 of The Donnellys—the hero, James, holds onto the heroine, Sonja, who continuously pushes him away, while at the same time holding him close. I know how painful it is to hold onto someone while their actions say one thing but their words say another. It’s beyond confusing and can really screw with your self worth. At the same time, Sonja has this incredibly screwed up dynamic with her ex-husband. Readers were appalled, but let me just say, I have a close friend who was stuck in that same kind of dynamic for years. As humans, we sometimes do crazy things because we’re so deep inside the madness that is our life we can’t tell what’s right and wrong anymore. 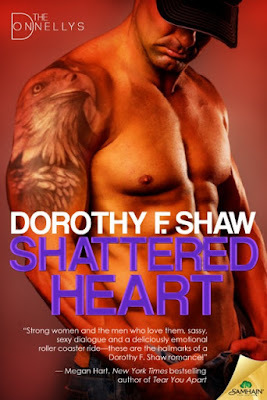 In Shattered Heart—book 3 of The Donnellys—the heroine, Cyn, has something happen to her that no one should ever have to experience. Well, needless to say, I’ve been there too. She survives, and so did I. The point is, if I can share an experience, or a truth, through my writing and it somehow helps someone else? That. Is. Gold. My kind of romance is not for everyone. I understand that. But for those that love to read reality in their romance…then, have a seat next to me. Because I have a story for you.